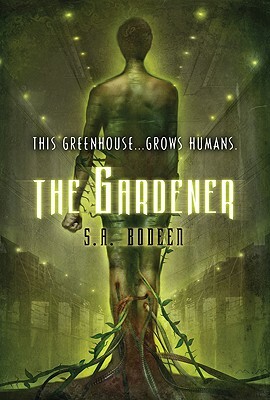 The Gardener by S.A. Bodeen. (Grades 7+) Feiwel & Friends, May 2010. Reviewed from ARC provided by publisher. Mason's always had some questions about his past. He never knew his father and his mom is suspiciously quiet about a mysterious college fund that's been set aside for him. When Mason finds the beautiful girl locked away in the rest home where his mom works, something sparks. He knows he has to save her, no matter the cost. But the girl, part of an experiment designed to save humankind, will change everything. Okay, I am going to say something and I really mean it as a compliment. The Gardener reminded me of nothing more than the classic Christopher Pike books I read as a teen. That is, the writing doesn't particularly stand out. But once I picked it up, I didn't want to put it down. I'm not sure how a plot can be somewhat predictable and still be thrilling, but The Gardener manages it. Long review short, I think young teens are going to enjoy this one. It's a perfect summer read for when kids need a diversion. Find your teens that like thrillers and/or your teens that enjoyed S.A. Bodeen's first book, The Compound, and hand them this one, too. Hop on over and read more reviews at Book Notes and Stacked. The Gardener will be on shelves May 25. Oooh. I'll have to take a look at this one.